With a number of high profile issues occurring within the automotive and fleet industries in recent months, fleet managers are facing a tough year in 2019. With risings costs and tax liabilities likely to impact those managing and using traditional company cars, not to mention increasing fuel costs, many are looking for savings or alternatives to minimise the effects. The rising costs and complexities of running a vehicle fleet have never been greater and ensuring you have the right mobility solutions and fleet policies in place now will save you and your business valuable time and money in the future. This is where ERA Fleet Cost Management* will help by providing impartial, insightful and strategic solutions to support you to deliver on your financial, operational and environmental objectives. At the Budget 2018 the Office for Budget Responsibility assumed an increase in Exchequer revenue from April 2020 despite the number of employees paying Benefit In Kind (BIK) on a company vehicle reducing. Our recent news article provides further detail, particularly as hopes were dashed when the Chancellor failed to mention company cars in his speech despite calls from industry representatives for clarity beyond April 2020 when the taxation of all new cars will be based on emissions according to the Worldwide Harmonised Light Vehicle Test Procedure (WLTP). Below are some graphs visualising the changes in cost for a variety of popular company car vehicles. Cars registered after 1 September 2018 have CO2 figures based on Worldwide Harmonised Light Vehicles Test Procedures (WLTP). WLTP will replace the current system New European Driving Cycle (NEDC). There is further WLTP impact when it is fully implemented April 2020 which will push CO2 higher again. 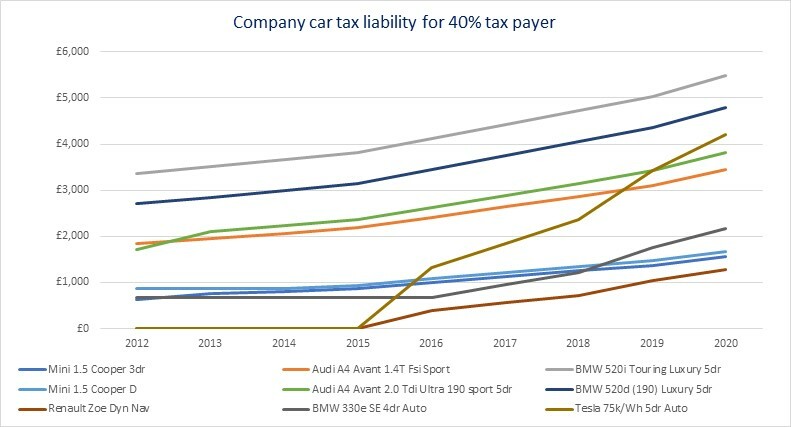 Fleet cars registered after 1 April 2020 will be taxed based upon their WLTP figures. However until this date VED and company car tax will be based on converted figures back to NEDC. 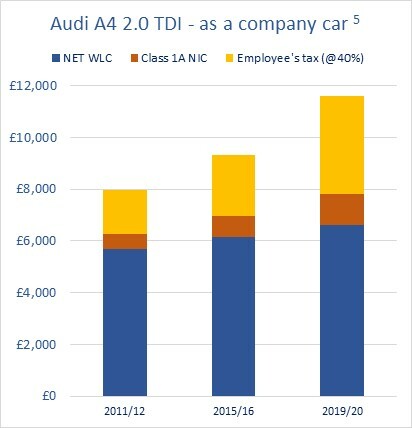 Data from Cap HPI shows a rise on average between 10% – 15% in CO2 emissions from WLTP published figures to NEDC correlated values pushing vehicles into higher benefit in kind (BIK) tax brackets and increasing employers NIC. The government has announced that new vans will be liable to pay VED based on CO2 emissions when first registered from April 2021, the WLTP impacts on vans will be considered separately. Company car BIK for diesel vehicles registered on or after 1 September 2017 that do not meet the Euro 6d emissions standard attract a 4% supplement up to a maximum of 37%. Frustratingly, the only thing that is clear is the growing complexity for those trying to determine the most cost effective way of managing their company cars and fleets. With so many factors to consider, getting specific expert advice can be hugely valuable, both in terms of peace of mind but also cost savings. Here at ERA we have a number of highly experienced fleet specialists who can review your current company car and fleet arrangements and provide strategic advice to ensure your costs are as efficient as possible. For a free, no obligation fleet review please contact us to arrange a meeting with our specialist team. *ERA Fleet Cost Management are a specialist division of Expense Reduction Analysts. We are not a leasing company, broker or car dealership and therefore able to provide an unbiased, transparent and thorough review of all aspects of your vehicle fleet in the key categories of Acquisition, Operation and Policy. About the Author: Steve Vare, joined Expense Reduction Analysts (ERA) in 2017, after more than 20 years in vehicle fleet management. 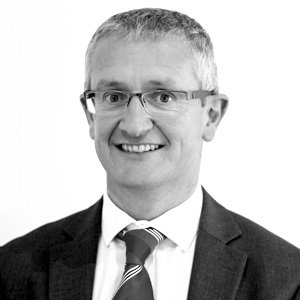 Steve has extensive knowledge of vehicle leasing, occupational road risk management & driver training and accident management, as well as experience of providing daily rental solutions to the UK corporate sector.